When writing or opining with regards to the Jazz Avante' Garde of the 1960s, many students and practitioners of the music often respond with names like Elvin Jones or Sunny Murray when asked about the drummers of the period. Often missing from their lists is master percussionist Milford Graves. Graves is a complete percussionist, having studied first hand drums then kit drums during his youth in the South Jamaica section of NYC. Born in 1942, Graves came of age as a musician playing Jazz in the 1950s, at a time the music was becoming both more complex harmonically and rhythmically. Another inspiration was the cultural material emerging from the nations of Africa and Asia, which had fought wars of liberation to free themselves from the European Colonialism that had shackled them into the mid 20th century. 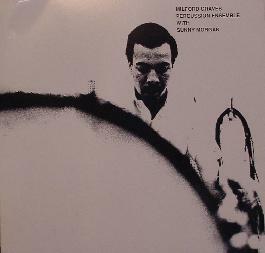 By the mid-60s, Milford had performed, recorded and jammed with the great innovators of the music, from Albert Ayler to Giuseppi Logan to Count Basie, and was singular amongst the free drummers due to his sheer technique, and the uncanny ability to play five to seven odd meter ostinados SIMULTANEOUSLY, utilizing multi-stick handling, and the use of Congas and Non-western percussion instruments as a part of the drum kit. Most are familiar with Milford's work with the amazing saxophonist Albert Ayler, in whose band he alternated the drum chair with the underrated Beaver Harris. But unlike those recordings, here we have Milford working in duets and solo with multi-directional percussionist Sonny Morgan, who had previously learned and perfected his craft in the bands of Olatungi, and various Latin and South American Percussion ensembles. These are amazing works, which capture the interest and imagination of the listener. The absence of melodic and chordal instruments actually adding to the captivating quality of the rhythmic barrage laid down by these drummers. All kinds of sounds come up, from deep other-worldly groans to straightforward displays of chops. For those learning the craft of percussion, these recordings are absolutely as essential for study as those by European "Academic Avante' Garde composers" such as Xennakis or Stockhausen! Of course, this recording had been impossible to find, with original LP copies going for hundreds of dollars. Bravo to Get Back for taking the responsibility for and showing interest in issuing this music so majestically on 20-weight vinyl. Anyone interested in exploring the large variety of music which was produced as part of the Free Jazz genre of the last 40 years would do themselves well by obtaining this and the many other recordings of the era this record company is making available to the listening public at this time. Get as many as possible, each is a real gem!